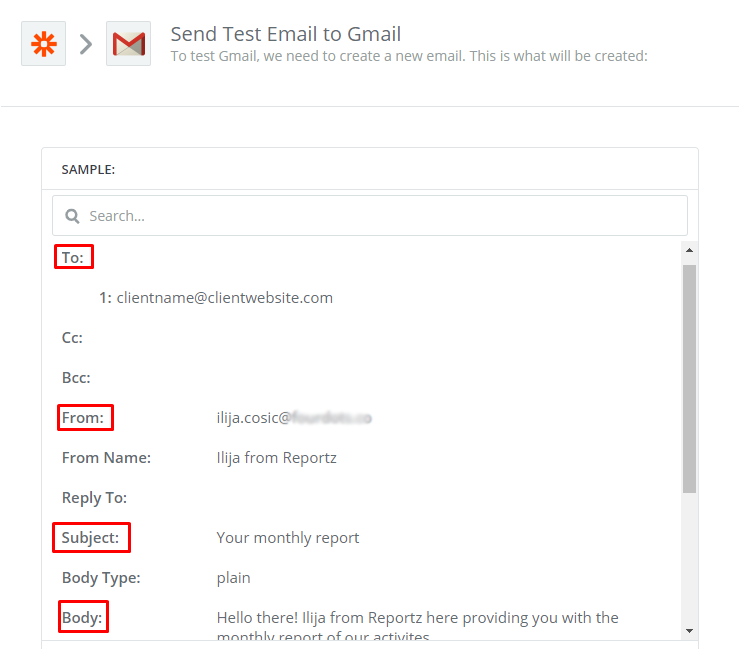 Follow the steps in this guide to set up an automated email for your client reporting. Since the development of our own solution for automated email reporting is still in progress, here’s a quick and simple workaround by using Zapier & Gmail. Go to Zapier and create a new zap. As a Trigger App, find and choose “Schedule by Zapier”. Click on it and select the trigger time. By default, reporting is done once a month, so in this guide, we will be choosing Every Month as trigger time. Click on Continue and proceed with setting up for which day of the month you want your report to be sent. In this particular case, we’ve set up the report to be sent on the 25th at 3 PM. Click on Continue, skip testing this step/sample, and click on Continue again. Now proceed with connecting your Gmail account. Create a new Zap and select Gmail as your Action App. Click on Save + Continue and select the account from which you want your emails to be sent. If you don’t have an account connected previously, you can connect one by clicking on Connect an Account. After you’ve finished connecting and selecting the account, click on Save + Continue. Now it’s time to set up the template which you’ll be using for sending the email. In the first box add your client’s email address. If there’s somebody else who should be included in your reporting activities, you can add them in the CC or BCC boxes. In the “From” box select the email address you’ve previously connected with Gmail. Type your name in the “From Name” box. In the Body field, you should set up a functional copy that you don’t have to change on a monthly basis. IMPORTANT NOTICE: When you paste your Reportz dashboard URL, don’t copy it from the view mode, instead just copy the URL from the edit mode without predefined date ranges. The same method works if you have your own white-label subdomain. If you’re using custom labels in your inbox, be sure to mark these emails in the Label/Mailbox segment. If you wish to provide your client with more attachments you can upload them directly in the Attachments segment. Click on continue & if you wish to, you can test out this step. We’ve marked the 4 most important steps by a square you’re required to set up in the Template. Test, or skip the Test, & click on Finish to save your Zap. 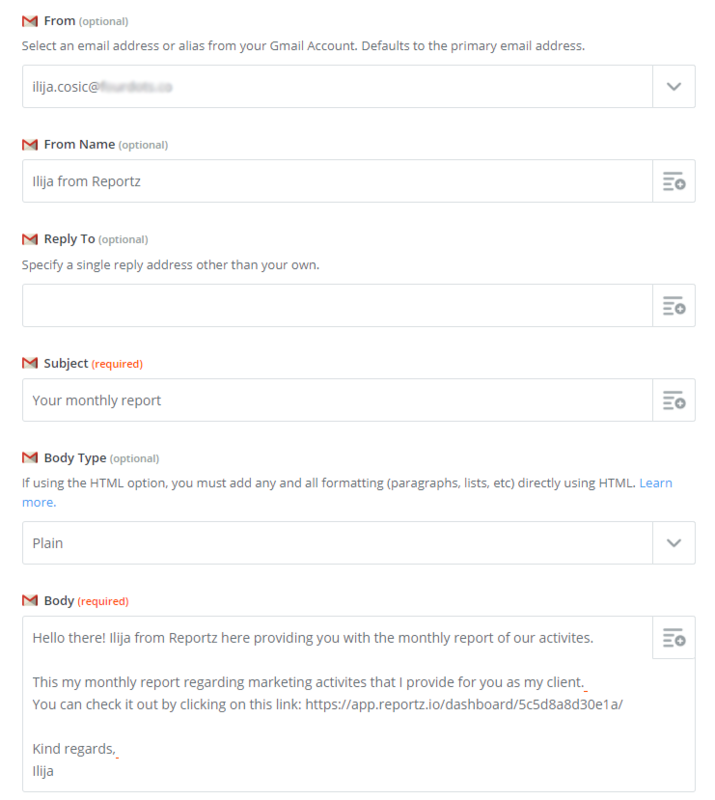 Name it, set it live & hop on to your Zapier dashboard to clone this report and set up a new one for each of your clients.